Strona główna Fototapety Kolekcje Retro Seamless watercolor illustration of tropical leaves, dense jungle. Hand painted. Banner with tropic summertime motif may be used as background texture, wrapping paper, textile or wallpaper design. 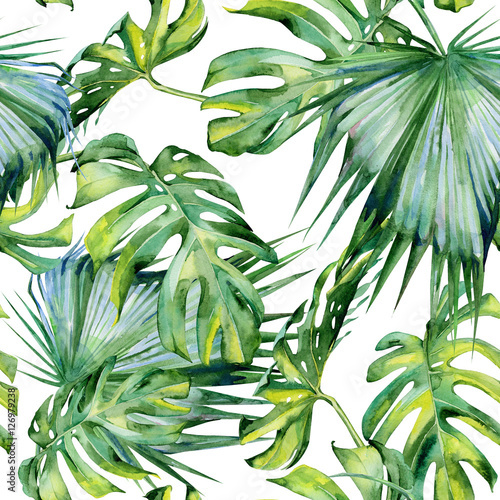 132673288 Seamless watercolor illustration of tropical leaves, dense jungle. Hand painted. Banner with tropic summertime motif may be used as background texture, wrapping paper, textile or wallpaper design. 126979503 Seamless watercolor illustration of tropical leaves, dense jungle. Hand painted. Banner with tropic summertime motif may be used as background texture, wrapping paper, textile or wallpaper design. 130874887 Seamless watercolor illustration of tropical leaves, dense jungle. Hand painted. Banner with tropic summertime motif may be used as background texture, wrapping paper, textile or wallpaper design. 130874879 Seamless watercolor illustration of tropical leaves, dense jungle. Hand painted. Banner with tropic summertime motif may be used as background texture, wrapping paper, textile or wallpaper design. 126979296 Seamless watercolor illustration of tropical leaves, dense jungle. Hand painted. Banner with tropic summertime motif may be used as background texture, wrapping paper, textile or wallpaper design. 126979309 Seamless watercolor illustration of tropical leaves, dense jungle. Hand painted. Banner with tropic summertime motif may be used as background texture, wrapping paper, textile or wallpaper design. 126979180 Seamless watercolor illustration of tropical leaves, dense jungle. Hand painted. Banner with tropic summertime motif may be used as background texture, wrapping paper, textile or wallpaper design. 130874902 Seamless watercolor illustration of tropical leaves, dense jungle. Hand painted. Banner with tropic summertime motif may be used as background texture, wrapping paper, textile or wallpaper design. 126980146 Seamless watercolor illustration of tropical leaves, dense jungle. Hand painted. Banner with tropic summertime motif may be used as background texture, wrapping paper, textile or wallpaper design. 126979348 Seamless watercolor illustration of tropical leaves, dense jungle. Hand painted. Banner with tropic summertime motif may be used as background texture, wrapping paper, textile or wallpaper design. 126980122 Seamless watercolor illustration of tropical leaves, dense jungle. Hand painted. Banner with tropic summertime motif may be used as background texture, wrapping paper, textile or wallpaper design. 130874916 Seamless watercolor illustration of tropical leaves, dense jungle. Hand painted. Banner with tropic summertime motif may be used as background texture, wrapping paper, textile or wallpaper design. 126979444 Seamless watercolor illustration of tropical leaves, dense jungle. Hand painted. Banner with tropic summertime motif may be used as background texture, wrapping paper, textile or wallpaper design. 126981062 Seamless watercolor illustration of tropical leaves, dense jungle. Hand painted. Banner with tropic summertime motif may be used as background texture, wrapping paper, textile or wallpaper design. 132242529 Seamless watercolor illustration of tropical leaves, dense jungle. Hibiscus. Banner with tropic summertime motif may be used as background texture, wrapping paper, textile or wallpaper design. 126980960 Seamless watercolor illustration of tropical leaves, dense jungle. Hand painted. Banner with tropic summertime motif may be used as background texture, wrapping paper, textile or wallpaper design. 126980911 Seamless watercolor illustration of tropical leaves, dense jungle. Hand painted. Banner with tropic summertime motif may be used as background texture, wrapping paper, textile or wallpaper design.